Equity linked savings scheme (ELSS) is one of the best income tax saver scheme.It has following benefits. 1. Investment in the share market along with the income tax savings. 2. Maturity amount and profit is also tax-free. 3. The lock in period of 3 (three) years is shortest. 4. Earning potential is the highest. 5. 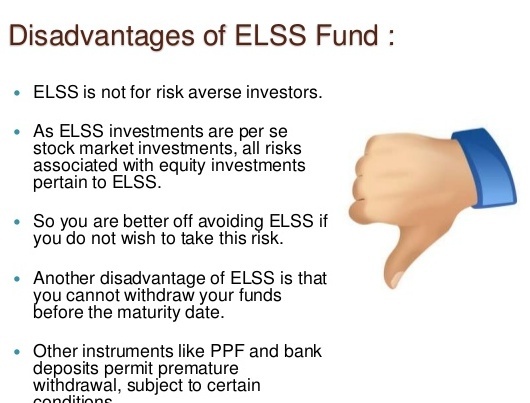 Investment in ELSS is very easy. 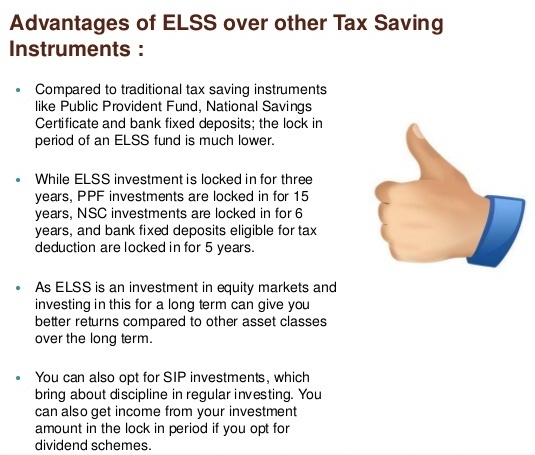 Besides these benefits, there are some disadvantages of the ELSS Tax Savings Fund . You must go through these before investing in a income tax savings mutual fund scheme. 1. Your money is subject to the stock market risk. Market may go down. 2. Expenses are highest among all category of mutual funds. 3. Premature withdrawal is not possible. 4. Subsequent investment is also locked for 3 years. 5. You can not reduce the impact of market fall, as you can not switch or redeem investment before 3 (three) years.